The #DCTV Couch Club is a team of DC fans dedicated to exploring the shared universe of The CW’s Supergirl, The Flash, Arrow and DC’s Legends of Tomorrow. Look for new Couch Club posts here on DCComics.com after every new episode! Hey, hey! I’m the Couch Club writer for Arrow, but I was asked to write for this week’s episode of Supergirl. I was a little nervous coming into tonight’s episode because my only exposure to the show was during the crossover event and I know it has a pretty big following. So, I didn’t know if I was going to totally get everything going on in terms of characters, storyline, etc. However…I lucked out! Tonight’s episode felt very much like a contained story and was pretty basic in its structure: New villain appears, causes problems for hero, hero figures it out, villain is defeated. 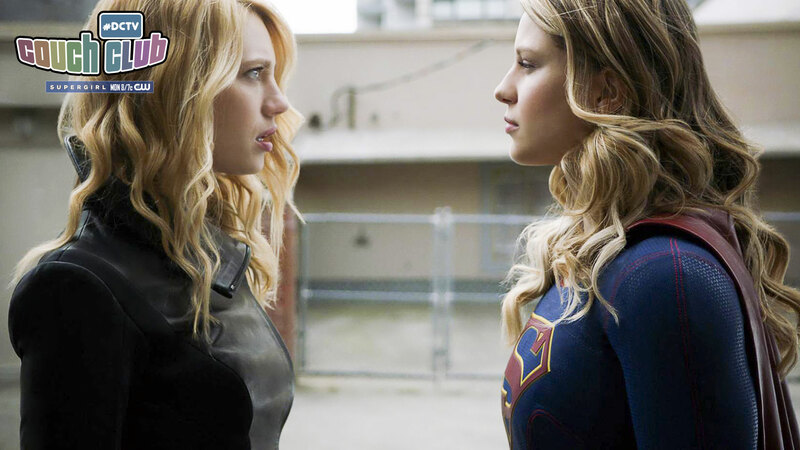 Outside of that, you had all the characters’ storylines as part of the bigger picture that’s been built for the show, but it was easy to kind of piece together each one and get a general idea for how everyone “fits” into the Supergirl universe. Tonight was definitely a good place for someone with no previous exposure to the show to jump on at. There were also a few things I really liked and a one that hit close to home. Before I get to that, though, I need to get something off my chest real quick. I know this is me nitpicking and not letting myself give in to the suspension of disbelief…but let’s hope that elevator Kara blasted out of didn’t have a camera in it and/or no one finds the purse that she left behind. That’s a pretty quick way to blow your secret identity. Ha ha! I like where this Samantha Arias story seems to be going. It’s clear she has powers, but she either doesn’t believe it, or is willing to not believe it. The dynamic it creates with her daughter reminds me of the great movie, Unbreakable, starring Bruce Willis. The idea that you might have powers and you don’t believe it, but someone close to you does, is very cool. Good ending with Sam failing to bend the crowbar, too. Let that play out a little bit longer. To my point I made a little earlier in this column, I think the strength of this episode is due entirely to the villain, Gayle Marsh—aka Psi—and the simplicity in which they used her. Psi is a psychic character who first appearance in1982’S DARING NEW ADVENTURES OF SUPERGIRL #1. She was affiliated with the Suicide Squad for a bit and actually made an appearance in Geoff Johns’ BLACKEST NIGHT as one of the Black Lantern Corps after her corpse is reanimated alongside some of the other dead Suicide Squad members—wicked! What I liked is that they avoided the trap that some of these shows fall into—which is to make an overly complicated motive and running agenda for these villains. This episode was about as straightforward as it gets: Psi used her power to rob banks because she wanted money. Nice. No over-the-top evil plan to destroy the world or mess with the hero’s life—just a simple baddie that needed to be stopped. I also dig her power. As I’ve gotten older, I find the scariest villains are the ones that can mess with the hero’s mind. Psi has a little bit of Scarecrow in her in the sense that she can unlock your greatest fear. You can be the toughest guy or gal around, but nothing will bring you to your knees faster than a mental strike! I thought the most unique angle of tonight was how Kara succumbed to panic attacks because of the fear that Psi had drummed up. Having known someone with panic disorder, it was pretty scary to hear from her how the panic could come on out of nowhere and essentially cripple her. It can even prevent people from being able to leave their house or fulfill a normal life. Even though they didn’t delve into that too deeply, I thought it was an interesting to show how a character of immense strength and power could be rendered powerless in the wake of a more unconventional attack. So thank you for letting me visit the world of Supergirl for a night and share my thoughts with you. Maybe we’ll do it again sometime! Guest writer Matt Ross covers Arrow as a part of the #DCTV Couch Club. Supergirl airs Mondays at 8 p.m. (7 p.m. CST) on The CW. The #DCTV Couch Club is Back!